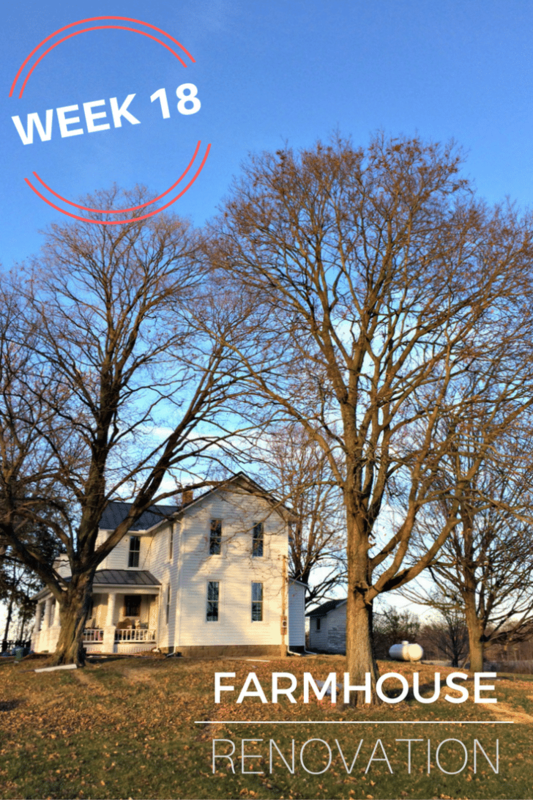 The weather is changing, the leaves have fallen and we’re still at work on the farmhouse! 🙂 This week is a whole lotta floor info. That’s about all that got done this week, but it was a big thing to get started. 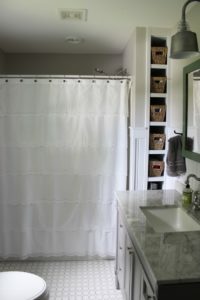 In the words of Rehab Addict, Nicole Curtis, “Why in the h*ll would you cover that up! ?” That is a question I would love to ask my ancestors. 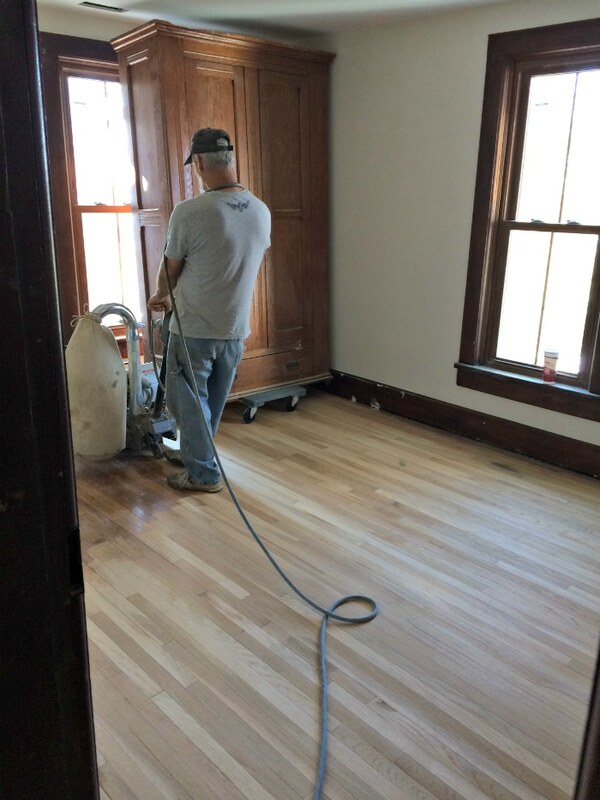 And you’ll see why as you see these before and after photos of our floors being sanded. The work started with patching some holes which caused me great anxiety. I wanted to keep the little pieces of metal, some of them tin can lids, as a cool accent to the floors. But practicality won out. They were sharp on the edges and would be a pain to sand around. 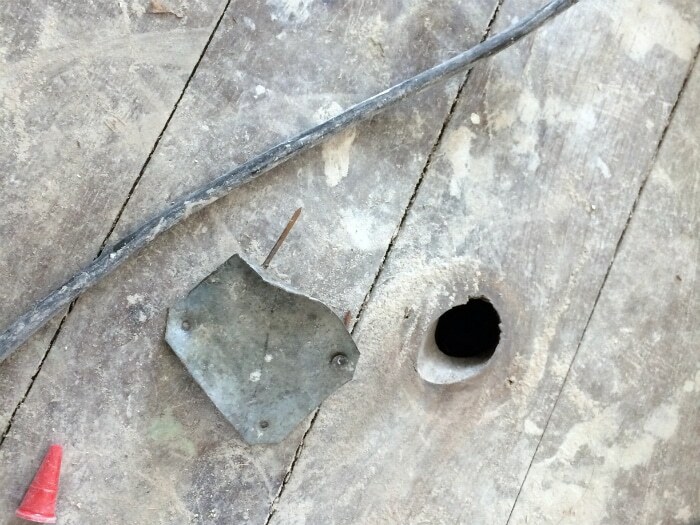 When removing the little metal covers, we exposed knot holes in the pine floors. Our sub-contractor who had never worked with floors (he’s an amazing tile and drywall guy) attempted to epoxy them hence my anxiety. The verdict is still out whether it will look good later, but there’s no going back and the floors are full of character anyways. I’m going to have to let that one go. Will keep you posted. We discovered some kind of grass like flooring in the master bedroom. 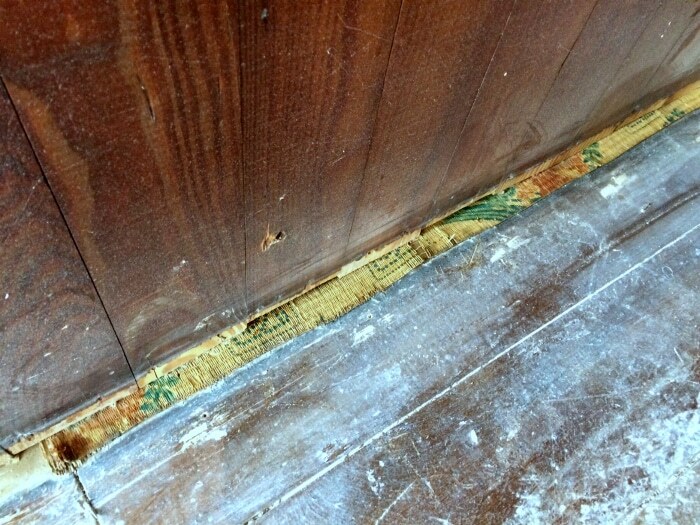 They had built the closet right over the flooring. Because, why not? It was cool to see it but it did need to be removed. 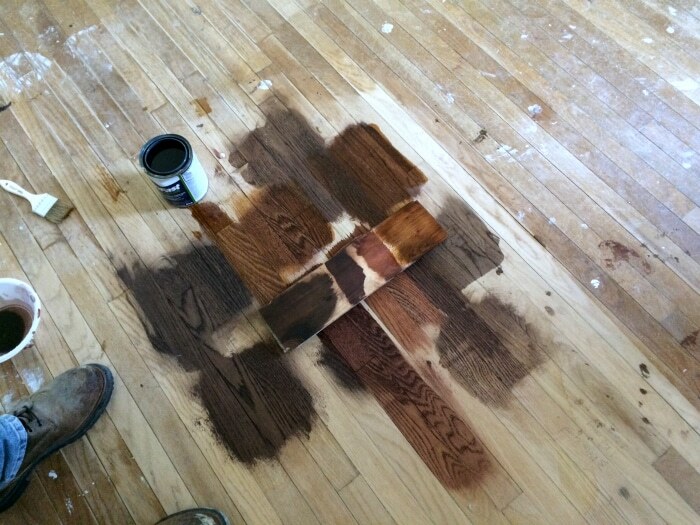 The first step for the floor refinishers was to sand off a section so we could sample some stain colors. Amazing to see the difference! This is the pine floor in the front living room. We have matching floors in our master. They are 4 inches wide and full of knotty character. 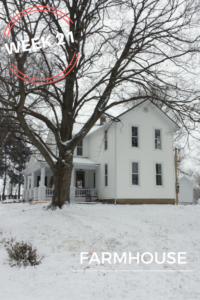 Most of the house has oak that my great-grandfather installed to cover the holes in the floor from installing the electric sometime in the 1930’s we think. They’re beautiful. Here lies the many stain colors to pick from. My expectation was that they would arrive with a few colors and we would pick them out. It turns out they can mix any number of colors which means the possibilities are endless. Paralysis by analysis my friends. The woodwork in the house has many tones to it because of it’s age. So the question became, do we go more red or more brown. How dark do we go? We looked at them all for an afternoon and then the next day. We think we picked the best one. I’m sure it will be fine. I cannot imagine how incredibly overwhelming this would be for someone that is not decisive like myself. The stainers told us stories of people who looked at literally hundreds of samples on their floors unable to make a decision. I totally get it. I do. 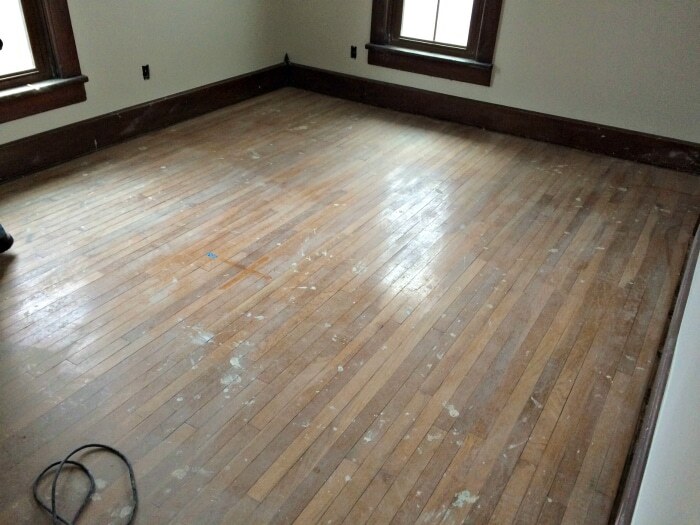 Here’s the kids room before they sanded. These are the oak floors that my great-grandfather put in. And here it is during the process. So pretty! It really is amazing what a little sanding will do. Here’s the dining room (original kitchen) that we thought was pine. It was covered with carpet my entire life. You can faintly see how they stained around the edges and not the middle. My dad brought up the fact that he would love to be able to peak into this room in the early 1900’s to see our family sitting around the Thanksgiving day table. What an amazing thing that would be to see. Here’s what the dining room floor looks like now close up. We now think the dining room is oak? There are no knots in it. So after sanding down the first floor they left us two big samples to look at over the weekend. The one on the right is the color I picked for our pine floors. The color on the left is the color I picked for our oak floors. 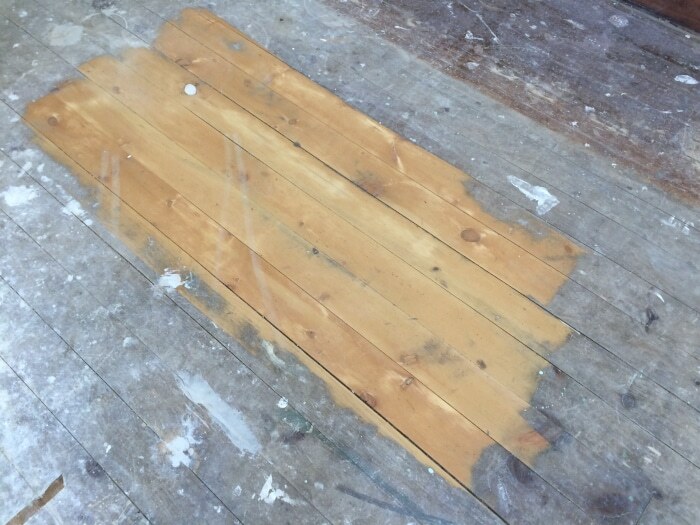 The can of sealer is sitting on a piece of pine to compare the two with each type of wood in the house. 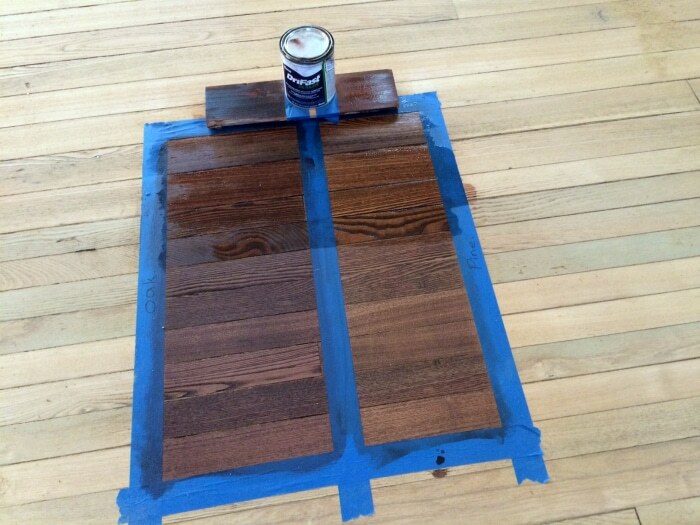 The top area of the large samples has the oil sealer painted on it which is truer to the color it will be. I’m leaning towards the color on the left for the dining room since our woodwork has so much red in it. Either way, I think they are both beautiful! What do you think? 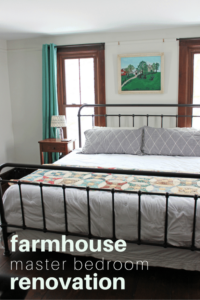 The big obstacle in the house was the gigantic armoire. It must have been built in the home as there was no way we were getting it out. We put it up on a piano mover and the floor refinishers are going to work around it. There’s just nothing else we can do. I have much to be thankful for as we enter this Thanksgiving week. My kids have been absolute troopers through this entire process. 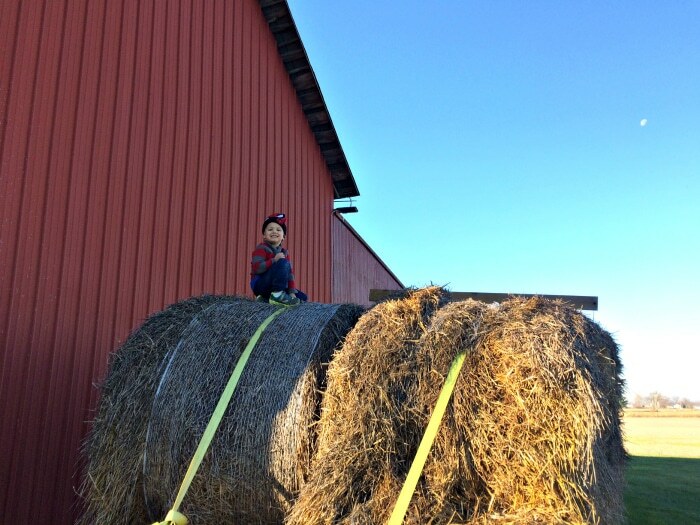 My youngest was climbing on the hay bales this week and I thought about how different their lives are going to be because of this move way out into the country. I’m thankful for it. It has been a long process with weeks to go, but I wouldn’t trade it for anything. Your floors are absolutely gorgeous! 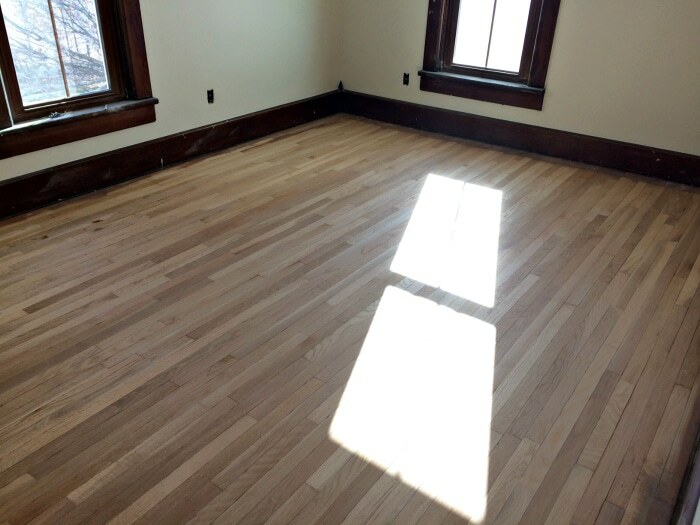 I am inspired as our only 15-year floors are in desperate need of re-finishing and staining, so I really appreciate seeing how great they can look. I am in So. 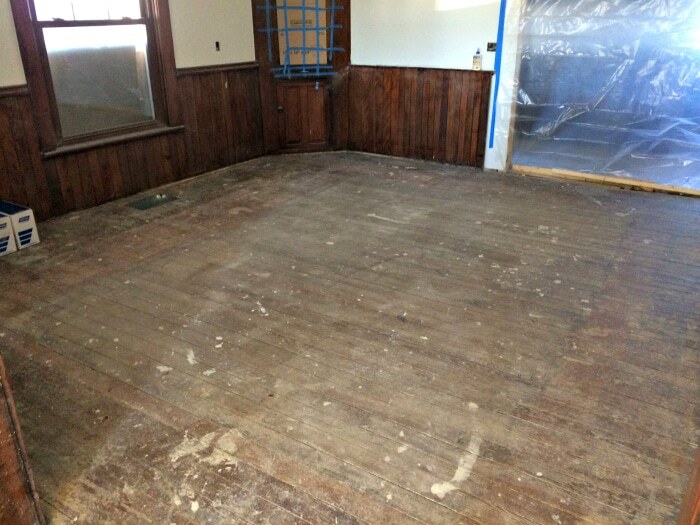 Delaware County/Powell area, so I wonder if you would be able to recommend your floor refinishers? 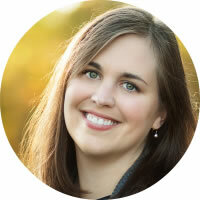 (I saw your grocery savings presentation at the Orange library many years ago so I think you are in the Delaware area?) 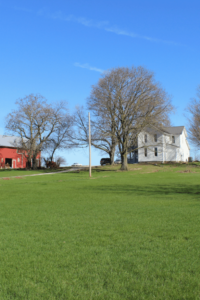 I have enjoyed seeing your progress, and its awesome how you have been able to keep the house in your family, it is absolutely gorgeous–can’t wait to see more pictures! Have a wonderful Thanksgiving. Hi Beth! Yes, I’m in Central Ohio. 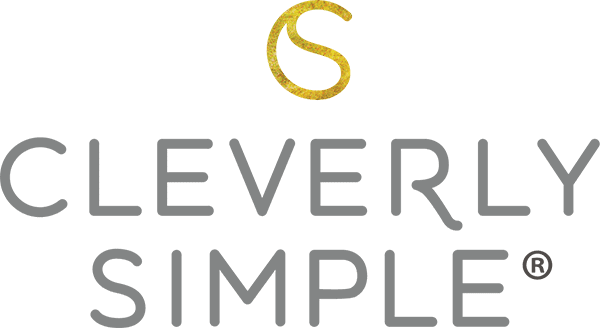 Feel free to send me an email at cleverlysimple @ gmail.com and I’ll share with you the company. I’m not ready to share all the info here yet until they are done, but I would be happy to let you know who is doing the work for us thus far. 🙂 Have a Happy Thanksgiving! I am enjoying the update on your house, I will be sorry when it’s complete, but glad for you. The wood floors are amazing. What a wonderful treasure for you and your family. I live in Columbus, someday in the Spring when I want to take a drive I’ll have to come by and look at your house (on the outside) when It’s finished. Happy Thanksgiving to your family from me.